The station stands on a viaduct and consists of a single island platform serving trains in both directions. The ticket machines and entrance are located at ground level to the west of the island platforms, facing onto Watney Street. The station is usually unstaffed like most other stations on the DLR. There is a crossover west of the station which allows trains from Westferry, Bank or Tower Gateway to reverse here. Here's the our members favorite photos of "Metro Stations near London Borough of Tower Hamlets". 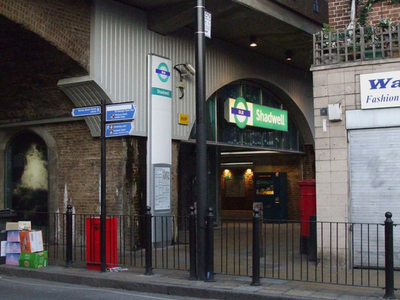 Upload your photo of Shadwell DLR Station!